In the past few months, Dwell has published a bevy of buildings sporting show-stopping and technically complicated ceilings, proving that innovative design doesn't just happen at eye level. 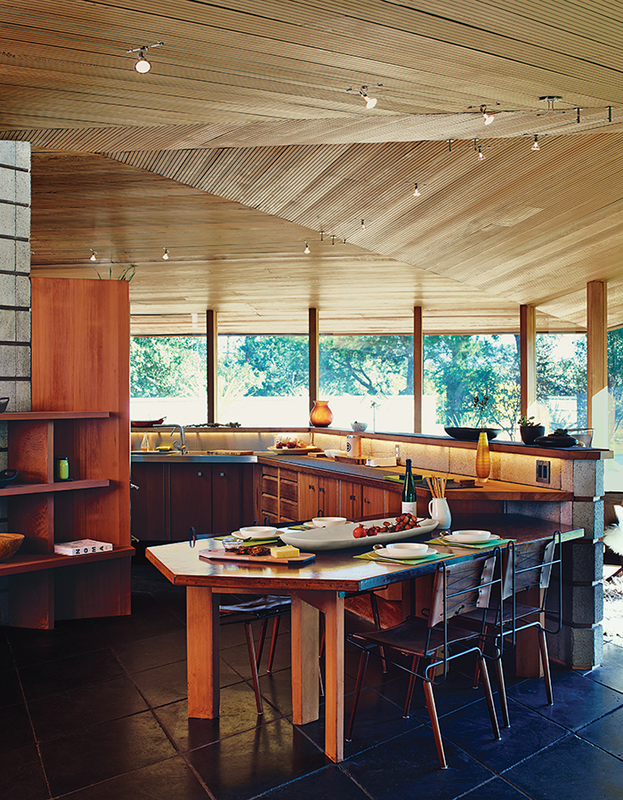 In Napa, a folded plate ceiling clad in restored redwood—improbably complex for the pre-CAD era—is carefully calibrated to the angle of the sun throughout the year to optimize heating and cooling. 41zero42's new line U-color comes in 64 kaleidoscopic hues; the three-by-12-inch porcelain pieces are inspired by the industrial wood floors of the 1970s, but are of the moment thanks to their subtle grain pattern and versatile applications (as seen on a sloped ceiling). This home in Japan relies on interior bookshelves as support and glass windows for exterior framing. Wood-fiber cement panels by Koa Funen line the ceiling, and the criss-crossing laminated veneer lumber beams are from Key-Tec. A prefabricated, off-the-grid home in eastern Washington’s high desert eschews structural columns thanks to a self-supporting, origami-like faceted roof. In this hyper-angular prefab home in Portland, a triangle pattern is also visible in the skylight hovering over the double-height main space. The ceiling beams are designed to resemble a honeycomb..
A restored and updated midcentury home in Portland employs a panoply of wood, including Douglas fir for the ceiling, hemlock for the walls, and stained oak for the floor. For this contemporary mosque outside of Istanbul, a serene, cave-like space sports a layered ceiling that echoes shallow steps leading down from the entrance to the communal worship space. Walls of slate and poured-in-place concrete define the 700-square-foot prayer hall, where a narrow skylight illuminates the Qiblah. Sprouting Sprocket's appealing mobile hut keeps molded components to a minimu: The studio first designed a lightweight frame and then enclosed the structure with taut fabric and sheets of Jobert Okume marine plywood.